Free Light Rail in the city? The Herald ran a couple of interesting pieces on the weekend looking at Queen St and its future. The main piece is relatively good – although annoyingly gets my name wrong – but importantly shows the growing support for improving Queen St from some of our politicians. Perhaps the most interesting aspect is this separate piece covering a suggestion by Phil Goff that light rail would be free in the city. 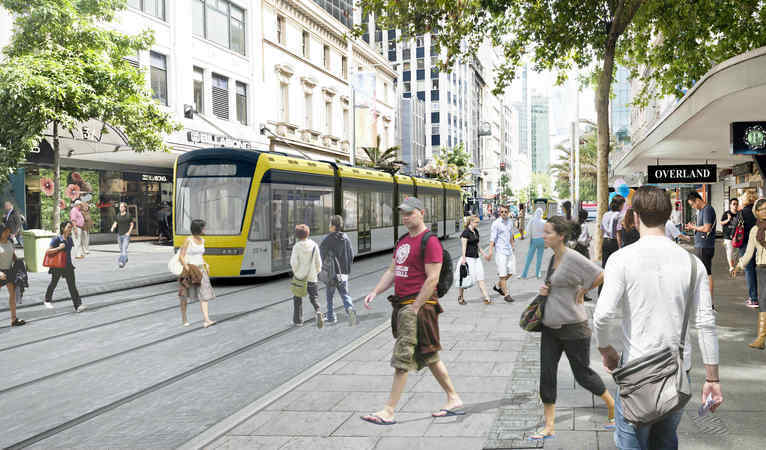 Mayor Phil Goff wants free travel for passengers on Queen Street’s planned new trams to be considered. The Government announced in May two tram routes were planned in Auckland, one of which will travel the length of Queen St on its way to Auckland Airport. Goff told the Weekend Herald he hoped passengers could ride for free on Queen St, but it would be up to those running the service to decide. He got the idea after seeing the same system working well in Melbourne. The City Link buses used to be free with a HOP card but that was stopped a while back. When it was in force, City Link buses were often severely overcrowded. Light Rail would obviously have a lot more capacity but we’ll most likely be wanting to use that capacity for those travelling down Dominion Rd rather than just a few stops up Queen St. Alternative options now exist for improving short trips, such as Onzo bikes and soon electric scooters. Many of the people who use the City Link buses are doing so as part of their daily commute, for example they’ve caught the train to the city and using it to get up Queen St. Providing they’ve used a HOP card, that extra trip is free anyway. Longer term, once the City Rail Link opens most of the users who currently transfer from train could just get off closer to their destination at Aotea or Karangahape. If we’re going to start handing out free travel on PT then other areas and demographic groups that should be considered first. Overall this kind of This feels like a bit of a distraction but it, and fare policy, is the kind of thing that will undoubtedly be continued to discussed for years to come. This seems well intentioned but would probably be a mistake. For anone coming into the city by train, bus or ferry, it’s effectively free anyway under the zone system. This really just leaves people who live in the city or drive in to benefit. Can they not pay the one zone fare like everyone else? It would be a marketing nightmare, people who drive into town or own apartments in the centre get free public transport of the highest quality, but people who live out in the suburbs have to pay to get a rumpy local bus down to the shops. It would also create the unfortunate arrangement where you sometimes don’t have to pay or have a ticket, that would undermine the revenue protection system. Much easier to say you must always tag on and tag off, or carry a paper ticket, that you usually have to but sometimes you don’t. Just a small point – it’s not free for ferry users, because we’re (still) waiting for integrated fares. Desperately needed! Indeed, but that is to do with the exception on the ferries, not the future light rail. The ferry thing should be fixed regardless. This does not address people who lives in upper queen and work in downtown city. At lunchtime wish to have lunch in Wynard quarter. After work need pick up the child at school in freemans bay. At night wish to watch movie at queen st. If it cost $1.90 each travel. This would adds ups to $10+ and make it too expensive. If the inner city travel is so expensive, it limits residences to only have a living radius of 300m. In this case the lifestyle would be quite boring. They can only eat the nearby restaurants, can only live near school, and have to pay a premium to live in expensive apartments that near their office. It would limits the ability for people to have low cost vibrant inner city lifestyle. Living in city would be boring and soul less that make people question their decision. Eventually they will move out to their suburban house and drive to work. Most people are fully capable of walking more than 300 metres. Hell, the building I work in is nearly 120 metres in length. Walking from the far end of the carpark to the far end of the building is 250 metres alone. I just walked 700 metres to get lunch then 700 metres to get back. The intended catchment of rail stations in Auckland is between 500 and a 1000 metres. If you want further proof how ridiculous that is, then a nine car railset will be 215 metres long. In other words you could end up walking nearly 300 metres if you get off at the wrong end of the platform before you’ve even exited the station! For example from Wyanard Quarter to upper queen st there is a 2.2km walk. Even 500 metres is a short distance. My nearest train station is over 500 metres away and is a comfortable walk. Westfield Albany itself is 350 metres long. A walk down to one end and back including getting to your car could very well be longer than a km. 2.2km is a fair distance to walk but I’m not convinced that free travel in the inner city is necessarily a good thing. After all you could make the same argument that you made except sub in any other part of the city. Why should I as a Mt Albert resident not be able to catch a free bus to Mt Eden for breakfast, St Lukes for shopping, Mt Albert for a beer, Sandringham for a curry, then Kingsland for some live music but someone in the inner city can? Not to mention that you’d have businesses and residents just out of the free zone lobbying to get it extended to them. It’s a good intention but it’s likely to just become a headache. Personally, I think having a spending cap for hopcard users would be much better. The difference in the suburb is you can easily drive and find a car park to hop between places. In the city driving short distance is not really practical consider the time and money to find a carpark. It will be up to you if using PT is worth that $10+ per day. If you move out and drive to work you’ll probably pay more than that just for parking. Add a lot more if this means your household has to own an extra car. Ideally you’d have monthly or yearly passes for this kind of situation but they’re quite expensive here. For getting around within a few kilometres riding a bicycle is always going to be much more convenient than either driving or taking PT. One of your stated reasons for advocating for free travel is because it would cost nearly $20 for your hypothetical day’s travel. Yet my trip would cost a similar amount given petrol used, vehicle maintenance, parking costs (not everywhere has free parking) etc. There are also a bunch of people living in the inner suburbs who don’t drive. Why should they be stuck to ‘a living radius of 300m’ simply because PT is expensive for them and they don’t want the expense of a car? By setting up a free zone you’re creating a privileged class of residents and businesses. Sure, people from outside can use that privilege but even you’ve stated that the target for this is people living in the inner city and they will get the lion’s share of the benefits whilst the rest of us subsidise them through our rates and payments into the fare box. Doing what London does and having a spending cap each day would be better and fairer. Travel in the inner city would thus contribute something to fare box recovery and the rest of the city will be benefit as well. Sounds like the city centre isn’t the right place for that hypothetical person. Plenty of others happy to take their place. If Auckland had a one-fare system (say $5.00) the uptake in public transport use would be dramatic. This would reduce the number of cars on the roads, and the city would move forward at a faster pace. Light rail to the airport is a no-no as the tram has to traverse the first 5/6 km at very low speeds. Better to run light rail from the airport to a re-developed Puhinui station and then the rail to anywhere on the rest of the system would be so much quicker. This would also be cheaper to implement and could be completed in 3/4 years against a possible 10+ years for the suggested scheme. I, like many people currently pay $3.30 a trip and many more pay $1.90, how is a $5 per trip cost going to ‘dramatically increase the uptake of PT’? Uh yeah, that’s more expensive than a three zone fare. All that would do is reduce the number of people travelling one, two or three zones, which I imagine is about 3/4 of all trips. 1. Free LRT in city would undermine integrated fares. Whatever the price of PT in the city, it should apply to all services (not just the PT that we happen to think is cool). 2. Free LRT in the city would undermine walking/cycling. I’m happy to subsidise PT to reduce negative effects of driving, but when you make it free then you start diverting people from active modes. This can be used to advantage. Up to 5 trips on buses or trains. Tag on within 30 minutes of tagging off your previous service. Question, is it an enforceable offence not to tag off at train stations? eg. could you catch the train from Britomart to Avondale, not tag off and go down to the markets for a couple of hours, then go back on a train again within 4 hours as one journey? I realise this isn’t what they intend you do, but would they have any way to prevent or check against this without gates forcing a tag-off? Interesting question. Melbourne’s introduction of a free fare zone in the city centre was largely driven by the inability of tourists to buy a fare onboard trams when Myki was fully rolled out and ticket machines were taken off trams. I’m assuming/ guessing that the Auckland light rail model will have ticket machines on the platforms so this shouldn’t be an issue here. The free trams in Melbourne also replaced a lot of short walking trips with short tram trips sometimes meaning customers travelling beyond the free fare zone can’t board over-crowded trams. And as the post and Nick R points out, a transfer onto a tram up Queen Street would bef free on transfer from a bus or train (and hopefully ferry when ferry is in the integrated fare system). I agree. Melbourne free tram services applies to all trams including the Circle the City’ trams. Trams traveling through the central city free ride zone trams can be become overcrowded with locals and tourists. There is a MyKi Explorer card, which I have one, can be used on all trams buses and suburban and regional trains, valid for 3 years and can be top up at any time during its validity. I paid A$15 (A$ 6 for the card and A$9 for 1 day cap travel) for my Myki Explorer card which comes in a plastic wallet, a map of Melbourne’s tram, suburban and regional trains serves and major tourist attractions. When I purchased my Explorer card, the PVT staff member told me to ‘Tap on’ first on my first ride so I could travel outside the city free tram zone without penalty. There is not reason for AT not introducing a Hop Explorer card for out of town and international tourists similar to Myki Explorer card. I see the AT has a Hop day Pass for N$28 ( $10 for the card and $18 for a days travel) but it is not that tourist friendly coampared to Myki Explorer card. I don’t believe we need to worry about tourists provided we make it very easy to buy a loaded HOP card. A start would be for the top up machines to actually sell cards. In Melbourne you can literally buy/top up a Myki card at any 7/11 so there really is no excuse not to have one if you want to use PT there. I confess that I do take a bus from Queen St up to Karangahape Road, due to the steepness of the hill, whether free or not. Always feel guilty for the engine and gearbox, which sound like they are about to expire. An issue currently is the upper queen st is too steep to walk up comfortably. This render the section between Mayoral Dr and K difficult to access. A free bus or light rail with a station close by would activate that area. Regarding to the moving sidewalks,it would make good sense for Victoria st up hill and may be Albert park up hill. There are numerous parts of Auckland that have accessibility challenges if you are not in a car, are you suggesting we provide free PT to all of these areas. I’m not convinced it will cause too much overcrowding – for example if 100 people get on at Britomart and get off at K road, that leaves room for 100 people to get on at K Road. a) – HOP card. Problem solved. b) – HOP card. Either make it easier for tourists to get one (that includes charging no more than 2-5$ for a blank card), or offer a time limited stored value card. c) – This will happen regardless, thought he integration with K Rd isn’t the best – Still have a steep-as climb to K rd from any LRT station. I think that discounting the trip should only occur when growth or patronage targets aren’t being met. Such promos should be very specific too, with amendments being made based upon the data gathered. c) There is poor integration in upper queen st between Mayoral drive and k road. CRL will not solve that area. Also I question why there is no LRT station near that section. It is quite steep and a station would activate that area. Agree on the cost of the card, there really is no reason to charge so much. They are free in Sydney for example. Good idea you get your Opal card for free when you put $25 on it so your not paying $10 for a piece of plastic that costs cents to make. It’s not the card you are paying for, its a deposit on the account that can go into negative balance. Without that, you could just get a new free card every time, put $1 on it, spend as much as you like on a trip then throw it away and do another one. The cost would be practically zero, all the infrastructure, systems and procedures would still be in place regardless. You’ll still need to install, stock and service ticket machines at all the stations, all platforms will need hop readers, and staff will still need check tickets. Unless you make the whole line to the airport free of course. Tourists I’m not sure. Your market would be limited to tourists who are staying in the city centre, only going to places between K Road and downtown, and who have already arrived by PT. That’s a pretty small market to worry about. Much easier to simply sell preloaded hop cards at the ticket machines on the platforms (and at the airport, cruise terminal, intercity coach and bus stations, etc). A vending machine that dispenses a hop card with credit for $20, alongside the drinks and snacks, would be super simple to put pretty much anywhere a tourist or new users would want to start. AT has a Hop day Pass for N$28 ( $10 for the card and $18 for a days travel) but it is not that tourist friendly). Last time I was in San Francisco back in 2011, they sold instant kiwi style scratchie PT passes where you pay for X amount of days, then on the scratchie card you scratch off the year, month, and day until the expiry date. I found it a lot more useful as a tourist in the city instead of having to purchase another card, which seems quite wasteful for a temporary trip and takes up valuable wallet space. Quickly start scratching when the ticket inspector gets on! Stagecoach used to have something similar for 3 day passes, i.e. when they were still Stagecoach and before AT Hop etc. Not that I paid that much attention or went on super touristy routes (although I did go on routes that went past MOTAT and the Zoo and to/from the city), but I never saw anyone using one besides myself. Mind you people were always weird on the routes I’m thinking of. A whole bunch of people got in at Pt Chev just after the bus got off the motorway or came from Great North Road. I presume they were Aucklanders. Most of them paid cash. The Ritchies buses went I think the exact same route from there, with most or all of the same stops. But a lot fewer got on to the Ritchies buses. I never knew if they this just didn’t know this or what. I don’t think it was a timing thing. In Pt Chev we used to be a bit wary of some bus companies because they had express buses and either wouldn’t stop or the driver would grumble. It wasn’t always clear that they were expresses, from memory. Also, snapper only worked for some of the companies. The other tricky thing was that you had to hold in your head the very long set of bus numbers that matched the route you wanted to use, many of which were similar to the bus numbers that didn’t match the route you wanted to use. I’d forgotten about all that. Gosh, we’ve come a long way. Goff’s comment ‘but it would be up to those running the service to decide’ is a bit concerning. I would have thought that LR would have to fit within AT’s pricing and ticketing system no matter who runs it. That’s a good comment in my opinion. The mayors office doesn’t run transit and has only a high level strategic role in transport at all, so its good that the mayor acknowledges he shouldn’t issue decrees on the matter. Fair enough if he is talking about AT, as long as he is not talking about the Pension Fund etc making this decision. Walking in between those areas is quite a long steep walk. The person lives in Upper queen st, and work at Wnyard Quarter, and wish to have lunch at high st and go back to office, have a meeting at Victoria Quarter (Spark), go back to office, and dinner at Victoria Quarter, and finish with a movie on cinema, and go back to Upper Queen. The little cost just adds up and it discouraging him from traveling between city areas. In that case, he wouldn’t be able to fund this life style everyday. So he live in suburb and drive to work instead. A free or almost free transport within city would open up the whole city centre and connect different parts together. It would support those active life styles and make the whole city much more connected and multi-function. And a daily pass for everyone paying about $2 peer day solves this problem and is more equitable. I struggle that the most affluent part of the city should have free public transport. In terms of residents, it’s actually one of the least affluent parts of Auckland. A lot of students and young singles mean the average household income is pretty much the lowest in Auckland. Ironic that someone name ‘taka-ite’ would suggest that city centre residents are wealthy! That depends on which part of the CBD you’re looking at. Wynyard Quarter certainly is a rich area. A lot of the cheaper apartments are in Victoria Quarter which won’t be served by LRT. Anyway the free LRT idea has the same flaw as the special $0.5 fare on the red link bus. It breaks the integrated ticketing. It means someone on Queen street or the Viaduct has a cheap bus to Wynyard Quarter, and someone in Victoria Quarter won’t (there you’d take line 75). Some form of daily or weekly caps or passes will be a better solution. Seems like a good reason to introduce a costly and complicated free fare system to serve the seven people who make all those trips on a daily basis, spending huge amounts of money on entertainment and dining, but never take an Uber and are too cheap to pay a couple bucks per trip. Probably the same people who need free parking on High St. I live in Sydney and don’t own a car, spending about $50 a week on PT fares and the odd Uber and even rarer Go Get (hire car), I estimate that my total transport spend is about $4k a year. That wouldn’t cover insurance and depreciation, let alone fuel, parking and maintenance. I don’t count the cost of fares, if I want to go somewhere I go, as the money I save by not having a car funds all the rest of of my travel. I very rarely hit the $15 a day/$60 a week cap for Sydney’s fare system and would pay $2500 per year for a yearly pass and not care about whether of travel was over or under the individual fare amount grossed up. Thinking about the marginal cost of a trip, in Kelvin’s example $2 doesn’t really make sense to me as it needs to be seen in the overall cost of the activity (transport) and the opportunity costs associated. I’d rather play on my phone than have to concentrate on driving and I save money by not having a car. There is an argument that there are limited places in Auckland, let alone NZ, where you can not have a car and be able to do the things you, but one of the reasons that I read this blog is that this is the place where that change is starting from. Hopefully a more walkable city centre will continue to develop but in anycase daily, weekly caps and such or distance based fares solves all these problems. I live in suburbia & small trips are also too much such that car travel becomes more attractive especially if you have others that travel with you. While there may be problems with out current fare structure, I don’t really understhand the ‘suburb’/drive to work point. A fair chunk of those journeys are at work. Either this person is going to drive to their lunch, meeting etc which sounds a bit of a disaster finding parking etc, or they’re going to have to pay this anyway. Only the dinner etc would this person perhaps avoid the fares if they go home to the suburbs and drive instead although they’d still have to pay for the car etc as others mentioned. BTW how is this person parking in the city for free anyway? If they get a free park in the city with their job, I’m a bit surprised they’re so fussed about spending $17 on public transport since they sound to be in a very high paying job. Of course this example does illustrate a problem with the way we allow companies to provide carparks without any FBT, but public transport passes are free. Christchurch used to run a free central city shuttle bus. Auckland could consider the same. Auckland used to run a free central city shuttle bus. Is was overloaded, crowded and slow. I used to sometimes use the CityLink in the very early days (2004 or so) when going from the UoA to Queen Street. Not that often though as walking was generally faster than catching it. Was especially bad if wanted to go to Britomart/downtown shopping area which given length of my journey sometimes sort of seemed worth it but not when you considered time. IIRC even coming back wasn’t guaranteed to be faster than walking even if there happened to be one waiting just when I wanted to go, given all the people getting on. Interesting that PT is free in Rome today for children under 10. Maybe I’m missing something but why are people assuming this wouldn’t use the Hop cards? I don’t see anything in the article which says this. Is it because of the Melbourne comparisons? I’m not saying it’s a good idea, but if I were designing this I would make it like the City Link was for a time and make it free only for Hop cards. While I appreciate the problem for tourists, it should hopefully reduce the confusion and fare evasion problems, as well as serving as another incentive for Hop cards. Maybe not so much of an issue for light rail although I assume still with costs, but definitely one for buses where people paying cash slows down everyone’s journey.